I agree some SG. But that’s like asking someone why they are interest in classic cars, boats, classical music, fine art, etc. Not for everyone sure, sometimes you just want a chunk of American muscle or Japanese. I mean a 34° club is a 34° club right? Not saying you are but when people are interested in these types of clubs people try to immediately talk them out of them into something else. Won’t ever hear anyone say don’t buy those SGI irons. ... When it comes to performance I am on record saying everyone should play the most forgiving iron they can effectively play. I just saw Tiger hit a 50 yd fade out of a bunker with a tree completely blocking his approach to a right pin and the ball had so much curve it moved left to right and then the spin pulled it further right. A fantastic shot only a small percentage of players in the world could pull off. So for Tiger, MB's are the most forgiving iron he can effectively play. Less than 1% of OEM sales are for MB's and there are certainly golfers that play their best golf with MB's but they are in a very small fraternity. There are Players Irons with shallow to deep cavities that can do most of what MB's can do but are more forgiving of slight mishits and much more forgiving of the occasionally egregious mishit. ... A pet peeve of mine is some of those that play MB's recommend them to others because they "help you focus better" or "do not mask your miss and you will become a better ball striker" among other excuses that may or may not be true for that individual but certainly do not apply to others. ... Of course there are many reasons to play this awesome game other than shooting your lowest score. I had students that insisted on playing MB's because they loved the look, the feel and the idea of playing the game at it's purest and relished the challenge of playing MB's, but understanding their scores would be lower with a full CB set or at least a combo set of MB short irons and CB mid/long irons. I would never try and talk anyone out of playing an iron that brings them the most joy and satisfaction unless they came to me for lessons and wanted to lower their scores. I have not played MB's in years and have no desire to play them now but have to admit looking at the new Z Forged MB's from Srixon, I had pangs of wanting to play a round with them. So I understand the allure of MB's, just make sure you know why you are playing them without any self delusion. I hear you Chisag. I’m not saying blades or MB’s or even a CB is the best fit for my game. But I can’t stand thick toplines, or a ton of offset. Not many irons that check that box outside of those irons. ... Right there with you! If the iron doesn't look like you can hit it well, you won't. As the saying goes, golf is at least 50% mental and the other 50% is mental. Confidence in your equipment is absolutely essential. I taught players that were confident in anything you put in front of them and others that simply couldn't hit a club successfully that didn't fit their eye. I had one student that was a perfect candidate for GI if not SGI irons but had convinced himself he could only play MB's. After a few months of trying different irons it was clear he changed his swing when hitting anything but MB's. Not intentionally, he just had a mental block. So even though he continued to hit the ball on the toe and low on the face more often than not, he worked really hard during lessons and always hit his MB's better. Not well mind you, but better than more forgiving irons. 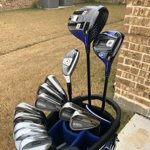 So feeling like I had given Dave every opportunity to take advantage of more forgiving irons I gave up and moved on to improving his swing with his MB's. I just saw Tiger﻿ hit a 50 yd fade out﻿ of a bunker with a tree completely blocking﻿ his approach to a right pin﻿ and the ball﻿ had so much curve it moved left to right and then the spin pulled it further right. Tiger said 9i in post-round interview. Was debating on 8i or 9i. Went with the 9i.